I am leaving UMBC with a much wider knowledge of the world. Attending UMBC alongside such a diverse group of students…exposed me to very different ways of thinking about the world, as well as many different cultural, racial, religious, socioeconomic, and national backgrounds. Dylan Elliott came to UMBC determined to become involved in his community by working with others. Four years later, he’s graduating from UMBC having helped lead the award-winning UMBC Mock Trial Team to its first appearance at the American Mock Trial Association’s National Championship Tournament. 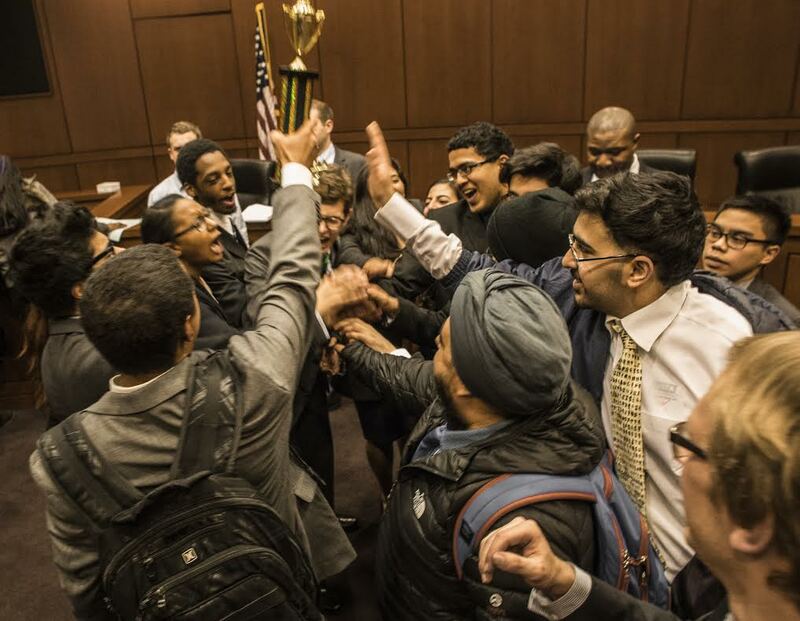 Dylan Elliott and the UMBC Mock Trial Team celebrate after earning their first bid to ORCS in February 2015; photo courtesy of the team. Elliott has served in several leadership roles, on the Humanities Scholars Program Senate, Residential Life Peer Review Council, and Honors College Council. He has supported students as a career peer advisor in the UMBC Career Center, and served as arts, humanities, and social sciences editor for the UMBC Review. He also received the UMBC Student Affairs Leadership Award this past April for his campus leadership over the past four years. Through a variety of experiences, Elliott has studied the legal profession, history of governance, and the work of policymakers. For his senior capstone project, Elliott spent hours in the Maryland State Archives researching Maryland’s chief tax official at the end of the Revolutionary War. His work earned the history department’s Joseph D. Reese Memorial Prize for best essay on a historical topic. He has also interned in the chambers of the Hon. Wanda Keyes Heard ’79, political science, in the Calvert County State’s Attorney’s Office, and worked as a legal assistant for the Dorsey Law Firm. Next, Elliott will pursue his J.D. degree from the University of Maryland Francis King Carey School of Law, with the intent to focus on civil rights and criminal law en route to a career as a public defender.